Brief Synopsis – In a reboot of the Bond franchise, 007 is sent on his first mission to stop a banker who holds millions of dollars of terrorist money. My Take on it – With this movie, it was decided to reboot the James Bond franchise and give us a younger, more agile Bond who is part the spy we all love but also part action hero which ups the ante and draw of this whole series. The choice of Daniel Craig as the new Bond was a wise one. He shares the suaveness and sense of humor as all previous incarnations of the character but also can hold his own in a physical fight. After rewatching this, I am convinced that he is one of the best actors to portray the super spy. For those die hard Connery or Moore fan, I’m willing to concede that he is at least the best choice for this day and age to continue the role. Madds Mikelssen is perfect as the Bond villain. He shares the suave quality of Bond but is also vicious and menacing when needed. I feel that I now have to continue to watch the Craig Bond movies perhaps followed by starting from the beginning of the whole series. Bottom Line – Great transition of Bond from a pseudo comedic spy to an action hero. Craig is amazing here and proves that he is one of the best Bonds because of his attitude onscreen and also his action hero status. Highly recommended! 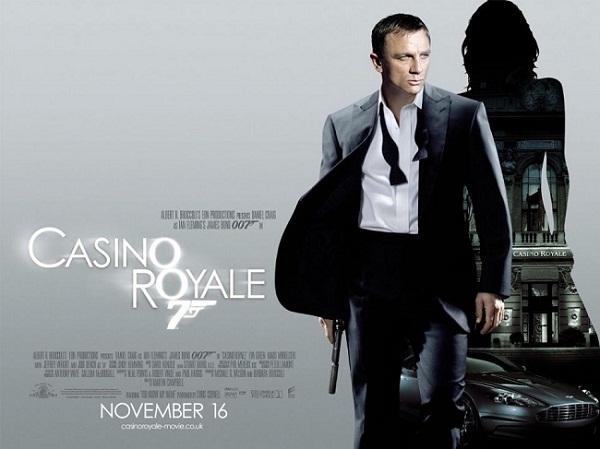 I think I prefer Dalton slightly more, because Craig is helped a lot by the direction, but yes, Royale is a fine film. This was a damn fine recommendation. Big fan of this film. Definitely my favourite Bond of all. Great review! I must still watch this, and it seems like a great idea to do so!